What is your stance on goods from China? Heyah! I stumbled across your MFC link on the Dungeon Travelers 2 page and GameFAQs, so I sent yah a friend request as I'm working my way through that game some more. AndyError (Il y a 4 ans) #2756492Thank you for the picture of a "canincan clip!" It looks awfully fragile and seems like it would not hold very well if I wanted to use it on my backpack or something. I also can't put the whole collection on my backpack at once since it'd look silly. I agree with you; I wish these had bases instead of clips for displaying the figures. There needs to be more Gekkan Shoujo Nozaki-kun figurines! There's a surprisingly low amount of figurines for this series. You're welcome ^^ Glad to help! Yeah you're right the clip does look fragile and I wouldn't like to get my figures lost. I really wanted them to have bases like the Color Colle of Card Captor Sakura, but clips? Well, you can still get them and put them on display in some way hanging from something, but it's not the same :/ I'm truly disappoited cos I was so hype after seeing chibi figures of GSNK -_- indeed this anime need more love, more figures! AndyError (Il y a 4 ans) #2755133Hey I saw your comment that you are buying the Gekkan Shoujo Nozaki-kun Color Collection on Sakura Chiyo's page, and I have a question. Do you know what a "canincan clip" is? According to Amiami, the figures feature canincan clips which allows it to attach to zippers and bags and such. Hi there! Thanks for sharing this info cos I didn't know if the set would have clips or bases. Ok so a "canincan clip" is just a simple clip so you can use it as charm in different ways (keychain, phone charm?, bag charm, etc). 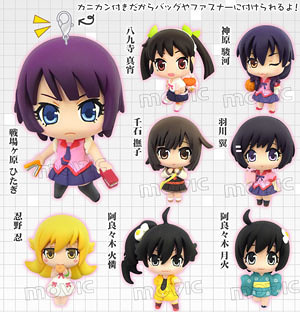 To have a better understanding of how this "clip" looks like, here's a pic of the Color Colle set of Monogatari series which has the same "canincan clip". Look carefully at the top of the figure's head. That's the same clip that's gonna be used for the GSNK set. And now I'm bored :/ I thought they were going to have bases so you can display them together, but clips? :( meh.